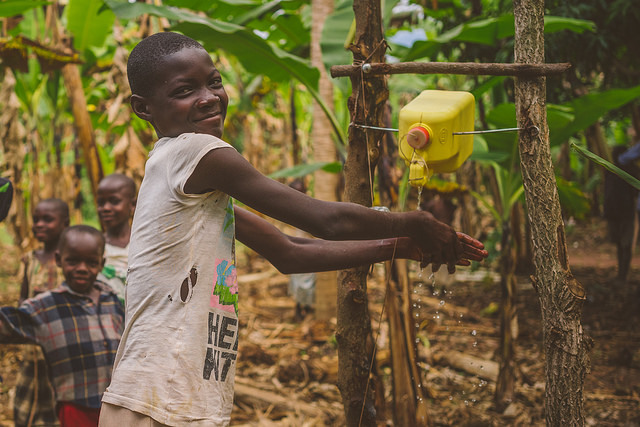 This past month, the John F. and Mary A. Geisse Foundation generously granted Lifewater $75,000 for a WASH Sustainability Pilot Program in East Africa. The grant will further Lifewater’s work to improve the sustainability of water points and Healthy Homes in remote, rural areas where safe water and sanitation coverage is very low. The grant will support a new strategy for sustainability that includes broader and frequent monitoring of homes and water points for a year after they are established. The pilot program will involve three regions in Ethiopia and Uganda where Lifewater currently works. In each region, two Lifewater staff members will visit every community, every water point, and more than 90% of homes on a quarterly basis. Additionally, every water committee will connect with Lifewater staff each month (in person or by phone) to ensure any issues are identified and addressed quickly. Lifewater’s approach (Vision of a Healthy Village) is the culmination of 38 years of experience in water access, sanitation, and hygiene (WASH) and exhaustive research of best practices in Christian community development. It has proven to be a viable model in creating sustainable, scalable change. These elements take months and sometimes even years for families to achieve on their own but they do so with the love, support, and encouragement of their neighbors and local Lifewater staff and volunteers. The true mark of success is when a village population has 90% Healthy Homes, a safe water source managed by a water committee, and is open-defecation free. Lifewater calls this a Healthy Village and it is a seminal event in the life of the village because it marks a turning point in their physical health and economic trajectory. How can we support communities that are struggling? What future program design modifications do we need to make in light of this information? Lifewater believes this proactive approach supporting and mobilizing families and villages after the initial intervention will result in more sustainable changes. A recent external study across several countries found that 15% of water points failed within the first year, and 25% within 4 years. If a water point is going to function in the long term, a water committee is an essential component of the healthy village. For a more thorough discussion of how water committees can be effective strategies for sustainability in rural areas, and to see the results of Lifewater’s most recent study, read Lifewater’s Sustainability and Rural Water Development whitepaper. The grant from the Geisse Foundation will help Lifewater improve its strategies and create lasting, sustainable change. By continuing engagement with households and communities after the project work is complete, Lifewater hopes to ensure safe water, sanitation, and hygiene changes continue to improve health and eradicate disease. Specifically, Lifewater hopes to find more than 90% of households, communities, and water points still functioning many years after they are first established. Furthermore, the extended support in communities means that the relationships established between Lifewater staff, church planting partners, and families continue to grow and bear fruit. Banks, B. & S. G. Furey, “What’s Working, Where, and for How Long. A 2016 Water Point Update to the RWSN (2009) statistics,” Rural Water Supply Network (2016), available at http://www.rural-water-supply.net/en/resources/details/203.